I was on a royal heritage quest, and my quest ended in Jaisalmer, which has wonderful gems to offer from the past. And the most fascinating are the havelis, which are a great testimony to the glorious past of Rajasthan. Recently on my tour to Jaisalmer I visited the three famous havelis of Jaisalmer and it was a perfect experience. Exquisitely carved these havelis were built hundreds of years back. Whether its their wood work or the stone work, everything about them is enchanting. Truly an architectural marvel, Nathmal Ji Ki Haveli is worth a visit. 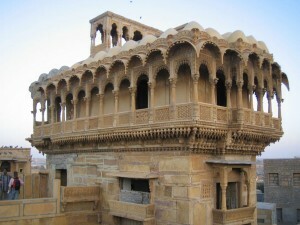 Located in the heart of Jaisalmer, it was built in a unique style by the two brothers Hathi and Lulu in the 19th century. One interesting feature about the haveli is that there is a geometrical irregularity in the structure. The two halves of the structure were made separately and then joined together by a facade. Although this dissimilarity was a mistake but it turned out to be an attraction of the haveli. It made the haveli look more beautiful. Elaborately carved, this haveli has mesmerizing interiors. Once the residence of Salim Singh, the erstwhile ruler of Jaisalmer, Salim Singh Ji Ki Haveli was built in the 17th century. Its roof was fashioned in the form of a peacock, which is amazingly carved. Each of its 38 balconies are carved in different styles, leaving visitors awe-inspired with their architectural beauty. The front side of the haveli juts out like a ship’s prow, that’s why the haveli is also known as Jahaz Mahal. It is the most luxurious and stunning haveli of Jaisalmer built in 1805 by a rich merchant named Guman Chand Patwa. Its complex consists of five separate structures, each having its own charm and beauty. Take a stroll through its 60 balconies known for their stunning lattice work. Some portion of the haveli is still occupied by the royal family. Two of the structures are managed by the Archaeological Survey of India. The mirror work and paintings of the haveli deserve mention. There are several other havelis with brilliant architectural style and stunning interiors in Jaisalmer. The sights of these royal structures is truly delightful. Some of them have also been converted into heritage hotels to offer amazing accommodation options to tourists.